Want to get away from the High rise hotels with the parking headaches, the noise and congestion, and just relax and enjoy the peace and quiet with your family, then our condo in Savannah Shores is what you are looking for. This wonderful condo community is ideal for the vacationing family, golfers, business person(s), and couples. Pack your clothes and golf bags..........everything else is ready and waiting for you at this relaxing environment. parking for the Atlantic Ocean Beach. If you prefer the exercise, you can walk along the paved paths to the beach, or use our golf cart, (which holds 4-6 people) for a fun ride to the beach. This Beautifully, professionally decorated 1 bedroom condo was designed by Knotting Hills Interiors. This unit has a lovely sunroom with French doors. This oasis is equipped with vertical blinds so you can close the French doors at night, pull the blinds, and then pull out the queen size sleeper, and this sunroom by day now becomes a private 2nd bedroom with huge walk in closet and a ceiling fan. All the furnishings and Appliances are brand new. with DVD for your favorite movies (Basic Cable with over 78 channels) . The large master bedroom has a new TV and generous walk-in closet. the 'straggler' that always comes on trips with your kids; therefore, this unit can sleep 4, but 6 very comfortably. Savannah Shores has a beautifully decorated club house equipped with an exercise room/gym, a business center with 2 wired computers, and wireless connections for your laptop, and all these conveniences are available for you(free of charge). You can grill your favorite foods by the pool (2 gas grills are located at the pool area) while your family swims in the cool, crisp, waters. This condo is smoke free and fully furnished. The only thing you have to bring is your toiletries. Property was as advertised. Apartment was clean and well stocked. Beds were comfortable. The beach was a short golf cart away. 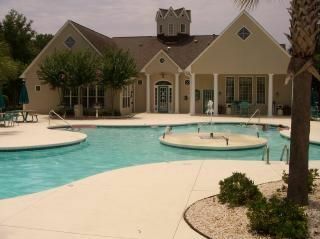 Pool, tennis courts and BBQ’s available. Will definitely stay here on our next trip! Fantastic lodging, great location, and an amazing host! We absolutely loved staying at Roseta’s place! The condo is a great space — very clean, spacious and comfy — and the location is so convenient! It felt like we were within 5-20 minutes of all the best eating, shopping and entertainment. Another great perk was the opportunity to use the host’s golf cart, making the trip to the beach a fun and easy ride — and quick too! And my favorite part of all was just how wonderful and helpful Roseta was when booking the condo. She had left behind some bottles of water in the fridge that we could help ourselves to, and she made available all sorts of beach goodies, like a beach umbrella, chairs, boogie boards, skim boards, shovels and pails, etc. that we were able to use, which was extremely convenient. She was very flexible and accommodating with our booking — we requested to book with less than 24 hours notice of our vacation dates (we were coming the next day), and she was able to accommodate that, and we were hoping to get a quick morning in at the beach before leaving on our last day, and she graciously extended our check-out time well past what is standard so we could have time to recuperate and shower before finally leaving, which we were so appreciative of. We really enjoyed staying in this condo and the owner is wonderful to work with as well. I highly recommend this place! Very clean and love to be able to use the golf cart! Also great communication with the owner! Thank you for a great family vacation! We are extremely happy your family enjoyed your vacation and thank you very much!!! We are happy to see your family year after year!! Thank you very much. We have always tried to treat our guests they way we want to be treated when we travel. We are very thankful your family keeps returning to our condo. We tell our guests we want to make them to feel like their home away from home and have a great vacation. Talk to you and your family soon! Rossi's, Throughbred's, Cagney's, and many others are just a minute away.